Home » angels , charlotte , presbyterian hospital , supernatural » Is this a photograph of an angel? Is this a photograph of an angel? I said in my last post that I was taking off until Christmas unless something demanded reporting about. Well, I think this might qualify, 'cuz I can't make heads or tails of this photo. Is it the real deal? 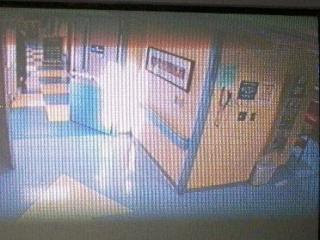 WFMY News 2 is reporting about this strange image caught by a security camera at Presbyterian Hospital in Charlotte. Many people are saying that it depicts an angel outside the room of 14-year old Chelsea Banton, who had just been removed from life support after extraordinary measures had been taken by doctors to keep her alive. The physicians had said that there was nothing more that could be done. Soon after, Chelsea's aunt spotted the unusual "signature" on the monitor screen and alerted Chelsea's mother Colleen. The image was observed by numerous other people including hospital staff. And immediately afterward, Chelsea Banton began to make a remarkable recovery. She will now celebrate her 15th birthday at home on Christmas Day. I've gotten pretty good at analyzing pics from years of working with Photoshop. And dog-gone if I know what exactly this photo depicts. WBTV News 3 has the original story about the apparent angel sighting. First I said it was the flash reflecting on the screen from the woman's camera. But it doesn't have the right shape for a flash and the light reflects off the floor. It puzzles me too about what it is. Maybe it really is an angel. There's no way to figure out what it is without knowing the layout of the hallway and time of day. I thought it might be sunlight reflected. There are some qualities that are unusual though. Is it so hard to believe that this could be an angel. We can all try to prove or disprove this image but seeing is not believing. The true miracle of this story is the little girls recovery and the fact that she will be able to spend christmas and her birthday at home. Perhaps this is just what the world needs to see this holiday season. Just maybe this image and story could spread a little hope and mystery for all of us who have lost our spirit. I consider myself to be a scientific man but also a spirtual man. On a skeptical or scientific veiw one could say that because the image was captured by a security camera that their is no flash that would have created the image. On the other hand one might say that simply a ghostly figure or "angel" saved the day. The point is it is not for us to decide or even know. God works in mysterious ways and this is just one of the many miracles he has given us. I am a spiritual person also. I definitely believe in a realm beyond the physical and that this also is a component of reality. At the same time however I am also very much an analytical man of science. And I also know that there is a danger at rushing to a conclusion simply because we want to believe in that conclusion. So it is that whenever I see a photo like this, my first instinct is to study it, and critique it and make every attempt that I know of to tear it apart and break it down. A little over three years ago I posted "The Top Ten Best Ghost Photographs Ever Taken". Not a month goes by since then when two or three people send me pictures to look at, wanting me to tell them that they have captured an image of a real ghost, and most of the time I have to tell them that "it's the strap of the camera that got in the way of the lens". And that's usually all that it is. Would it have been better to tell them that "oh yeah, that's a ghost, no doubt about it"? So I see this picture of an alleged angel, and I have to try to dissect it as best I can, and invite others to do the same. Not out of spite or that we don't believe in such a thing as angels, but because we are simply trying to arrive at the truth of the matter. If this is something that defies all physical explanation, then I and others will certainly exalt that quality. I completly agree with you chris. I did not mean for it to sound like the image is the "miracle", but rather the story itself of chelsea. I as you would much rather know if this image is real or not. In this case though I feel that leaving the image alone would be a nice gesture. If it gives people hope (espically the family of chelsea) do we as analytical creatures want to take that away from them and tell them that its just a grouping of dust particles that are reflecting light. I would hope that we could tell chelsea and her family that this is indeed an image of her gaurdian angel. You and I both know that disproving an image of what seems to be supernatural is easier than proving it. Even if the image could not be disproven the results would still be inconclusive. I must say that this is one of the most exciting images I have personally seen of a supposed supernatural form. Thank you for the open forum and posting this story. Merry Christmas to everyone. This is the sixth post on this story I've seen, and yet to see anyone point out the obvious- a bright light is shining into the room through the doorway, enough of a glare to reflect off the floor. That's it. What everyone is missing is the obvious square of light right in front of them (see the hard vertical edge easily to the left side of the picture, and the hard bottom edge crossing the triangle on the floor, then back up at a hard right angle at the right side.) All this angel talk is so foolish, when it is so obviously a time-warp into an extra dimension opening right in front of us. Gosh, how can some people be so silly to jump to conclusions that would disagree with the silly conclusions that I can jump to? And what is it about following Christ that means one is "too lazy and stupid to think for yourself"? I will admit: there are too many Christians who do disengage (and are even encouraged to do so) their minds when they become comfortably ensconced in their religion. But that isn't what it's supposed to mean to be a Christian at all. To sincerely seek after Christ is to die unto self in spirit and mind, that we might be renewed and grow in the new person that Christ alone can provide. Consequently, to earnestly pursue Christ means that a person cannot do otherwise than to grow in the mind that God has given us. I do not believe that being a Christian allows for that growth. That is mere religion. But chasing after Christ, does. Yes the real miracle is the child doing better, for which we are all happy. Unfortunately many of us Christians have earned that comment "too stupid to think for ourselves" More of us need to use Acts 17:11 as a springboard to seriously study things and learn for ourselves if something is so. Christmas Blessings on this community and all who read it.